FA Cup weekend is upon our Wessex League clubs already and the overriding feeling is one of excitement as the road to Wembley begins in early August. AFC Portchester, Horndean, Moneyfields and Fareham Town all do battle in the oldest competition in the world of football. And the prestige in which the Cup is held was only too apparent as the clubs looked ahead to their extra-preliminary round fixtures. Portchester head to fellow Wessex League premier division side Fawley on Sunday (3pm) with assistant boss Steve Johnson dreaming of a long run in the competition. He said: ‘The Cup gives great kudos to the club if we are successful. ‘The dream is to reach that first round and draw a league club – that has to be the aspiration. Moneyfields host division one side Christchurch tomorrow (3pm) with boss Dave Carter keen to see his side progress. He said: ‘It’s the biggest cup competition in the world. ‘All of the lads are looking forward to it – these are special days for clubs like us. 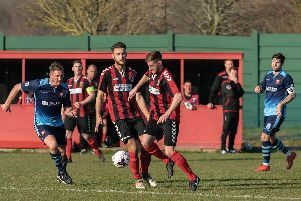 Horndean manager Michael Birmingham believes his players can make a name for themselves in the Cup – if they can first get past Bashley tomorrow (3pm). He said: ‘The good thing about the FA Cup is that it is all about the players – it can change them completely. ‘You can stop waking up at five o’clock in the morning to go and lay a whole load of bricks if you have success in this competition because the spotlight is on you. ‘But Bashley are a big side – it wasn’t too long ago they were playing in the Southern League premier division. Finally, Fareham Town travel to Bradford Town tomorrow (3pm) looking to bounce back from their 2-1 opening-day league defeat at home to Newport IOW.